How can this make your life more convenient? Everyday!!!! The Bubi bottle constructed from medical grade silicone. It is BPA-Free and can be used every day with multiple uses. The Bubi bottle is also the only bottle you can get into a sporting event to save on beverage purchases. Here are other ways it is useful to be sure to read the last paragraph. Toddlers; Use the Bubi bottle 14 oz with the first flip cap as a sippy cup. Just convert the Bubi bottle to a sippy cup by adding the flip lid. Tossing this bottle will not make much noise and hurt nobody. Preschool to high school; Take the 14 oz bottle and freeze it to place in the lunch bag. Better than an icepack, It will keep the food cold, and your child can drink while it melts to stay hydrated. At the end of the day, they can roll it up. Their backpack will weigh less with less bulk for the trek home. Sports events, Use the 22 oz or 35 oz when your child goes to sporting events, freeze it or add ice cubes add the Flip cap and now they have the perfect sports bottle. Rolls up to go home, won’t hurt anybody with the soft silicone and your child can easily keep their bottle as their own as we have multiple colors to match the favorite team color or their own. The bottle can also act as a hot or cold compress for injuries or sore muscles. Not only does it keep your child safe, but it is simple to clean, place it in the dishwasher, use soap and water or turn the bottle inside out to clean the inside from the outside — no need for a bottle brush, which doesn’t guarantee a clean bottle. 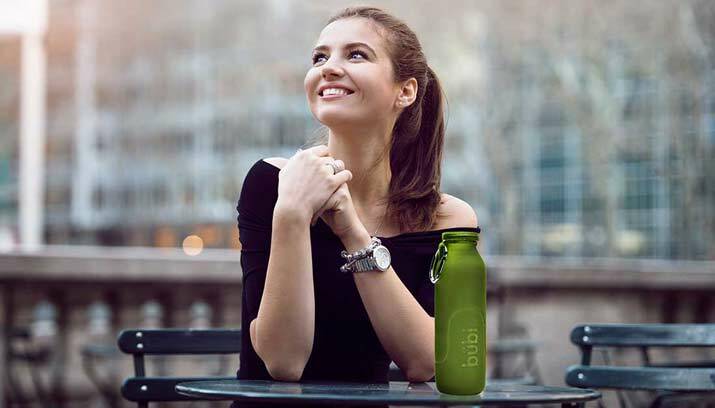 With the Bubi bottle, you will know that it clean.